Flashes of Style: Spring is here! Sooo, spring's arrival has left me refreshed and inspired to continue posting here on my blog and not just on instagram. I think I just needed the change of the seasons to get excited again about posting on here! I'd love to get your feedback on what you guys would like to see for upcoming posts. Do you guys miss outfit posts? Possibly photograph diaries? Beauty favorites? Let me know, I'm all ears! 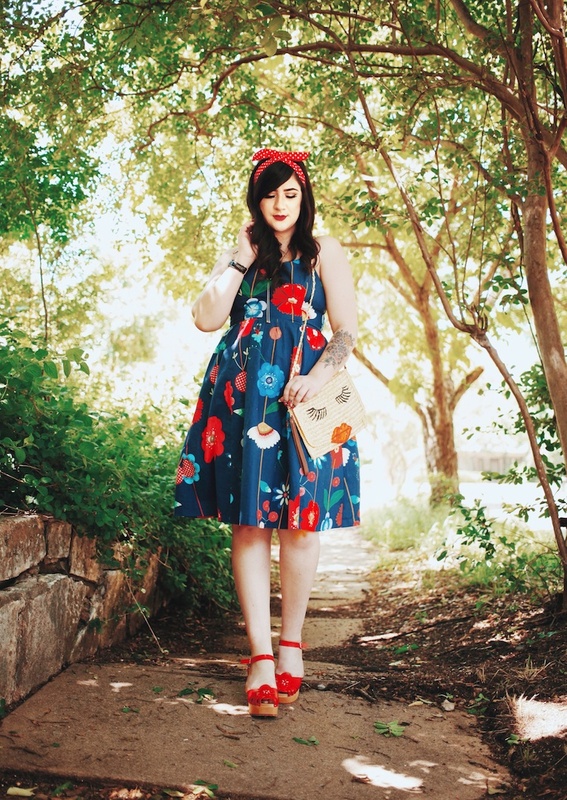 I was so excited to shoot this dress from Modcloth + these platforms by Swedish Hasbeens. If you ask me, it's the perfect spring look! Definitely investing in super simple sundresses for hot Austin summer days. I'm so excited to start posting regularly again! Love you all to pieces. Loving the bold floral pattern. This is the cuuuuutest dress ever! You look amazing. And I'm always down to hear beauty faves, cuz I'm trying to build my own army of beauty products. Beautiful dress!! so in love with it! I've been reading your blog for years and the outfit posts were my absolute favourites, along with the little stories about the items in it. The playlists were also great, maybe there could be playlists to go with the outfits and merge two awesome things into one? You look so rad with those floral dress and red lipstick. You must be really love summertime. I am obsessed with all of your quirky outfits!